In Baltimore I was a child in the fifties, during segregation. My parents had typical dreams for their children, and as the oldest, I was the point person, sent out into life with four siblings behind me. I got the usual messages, succeed and take care of the others, which is to say I think Americans are very similar once you get beyond the idea of race. Saying that, my ancestors are African, European, and Native American, but it comes out as African-American, the current nomenclature. My dad was a steelworker and my mom a part time beautician. I finished high school early at sixteen and spent two years at university before going into fifteen years of factory work, where I also wrote and published poetry and prose. With the aid of an NEA and a book contract with the University of Virginia, I was able to leave the factory and go into the graduate writing program at Brown. Afterwards I spent two years as an adjunct in New York and New Jersey before landing a tenure track position at Rutgers in 1990, sixteen years ago. At that time such jobs were much scarcer than they are now. In 1998 I signed on at Simmons where I hold an endowed chair. It lights up and plays old Broadway show tunes. That's what endowed chairs do. Just sit in one and see. Let me see. Well, I am sitting here now. It is actually the front part of this one bedroom apartment that I call home, or my Poet's Cave. I have a desk and it faces the wall of the bedroom. The desk has a top shelf. Actually, I suppose you could say it is a variation on the old accountant's desk. On that shelf I have a Buddha and some other things, memorabilia from my years in doing Taijiquan. There are books in front of me here that I use often, especially references for Chinese, several dictionaries. I love dictionaries and am forever on the quest for the perfect Chinese/English dictionary, one that combines pinyin with the phonetic system which only Taiwan uses now but which originated in Mainland. Behind me is the television and stereo, and to my left the kitchen. As I write I am baking a sumptuous chicken breast for dinner. You write poetry, fiction, and plays. Do you favor one over the others? Poetry is my main genre. Then I would said number two is playwriting, and fiction would be last for me. Two of your plays have been professionally produced. One play called, Elvira and the Lost Prince, won the Playwrights Discovery/Dev. Award. Please talk about this and your experiences as a playwright. When did you start writing plays? Are you currently writing a new play? I wrote a naïve play before going into Brown, and once there I switched from poetry to playwriting. That said, the bulk of my formal training has been in playwriting. At Brown it was a graduate student's dream. We could write anything and have it staged. I had the good fortune of having both Paula Vogel and the late George H. Bass as playwriting teachers. Professional theater was an initiation by fire. Theater is a tough world emotionally, and I was not prepared. However, the learning curve came very quickly. I learned a great deal about theater and life in the year I had those two professional productions, and after Elvira and the Lost Prince was done out there in Chicago at ETA theater, I joined that theater's PDI think tank. We set ourselves the mission of developing a school of thought for the future of black theater. That was a remarkable experience over the years. We met once or twice a year to view a play as a group and spend the weekend discussing the production in all its aspects. It was invaluable experience, and I was able to spend time with some of the great figures in black theater, people such as Woodie King and Ron Milner. PDI was founded by Abena Joan Brown, the founder of ETA theater. She is a remarkable woman. 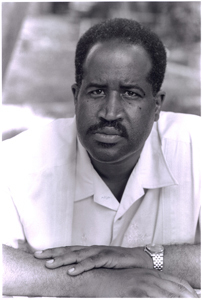 In 1989 I met James V. Hatch, one of the first generation scholars on black theater. His work includes the publication of the main anthology for black theater and its definitive history, the latter which he co-wrote with the late Eroll Hill, the Trinidadian scholar. You have quite an impressive history in editing. You founded Seventh Son Press, Blind Alleys, and at North Carolina State University edited Obsidian 111. What was this experience like? What type of writing did you look for? Seventh Son Press took its name partly from an earlier venture in publishing I did with two young friends when we were all in our twenties. I founded Seventh Son while a factory worker, and the Baltimore poet Melvin E. Brown was my co-editor for Blind Alleys. That was back in the days when you had blue boards for typesetting and Clifford Burke's book Printing It was the bible of the small presses. Computerized typesetting was just beginning to appear in 1980, twenty-six years ago when we started out. I taught myself the skills of editing and managing, and it was not long before I came to understand that distribution was the colossal challenge. Anyone can produce a small magazine, but try getting it into bookstores. When I took the job at Rutgers I had another job offer at NC State in Raleigh, which included editing Obsidian II. I declined the job but accepted the journal editing gig out of a sense of cultural duty. Obsidian is the third of the three sisters that came into being in the late seventies and early eighties. The other two are Callaloo and African-American Literature Forum. I changed the title to Obsidian III and set out to build on what the previous editor, Gerald Barrax, had established. Barrax is also a poet. I managed to transform the journal and build an admirable editorial staff complete with a routing system for manuscripts and an working production schedule. However, the commute from Boston to Raleigh was too taxing, and I gave it up in late 2000, just before I left for Taiwan on a Fulbright. I always looked for the best writing for both journals, and I had a diverse list in Blind Alleys. As the editor of Obsidian III I expanded the editorial policy to open it to writers of any identity who were writing about the black experience in any part of the Diaspora. I was questioning the definition of black literature. Recently, you edited a book about black family life called, These Hands I know. Talk about this book. To date it is the only collection about black family life written by poets and prose writers. I am quite proud of the book and wish more people would buy it. It should be valuable in any course concerning the life of the black family. You have numerous books to your publishing credit with a new book forthcoming in 2008. Please talk about your new book. I am delighted about this one. The University of Pittsburgh is doing it, and it is a reader of my work. The title is The Plum Flower Dance. U of Pitt's readers are designed for a long shelf life, and mine will be only the fourth to appear in the thirty year history of the press. Etheridge Knight, Ted Kooser, and Virgil Suarez are the other three poets so far. So this is a high honor. Other book publications include: The Ten Lights of God: Poems (Bucknell Univ. Press), Multitudes (Sarabande Books), Talisman (Ti Chih Ch'u Pan She), Water Song (Callaloo Series), some days it's a slow walk to evening (Paradigm Press), My Father's Geography (Univ. of Pittsburg Press), Stations in a Dream (Dolphin Moon Press), Timber and Prayer (Univ. of Pittsburg Press), Sandy Point ( The Press of Appletree Alley) I mention these publications so readers can check out your books. What has the book publication process been like for you? Oh, it's been the usual struggle. After Water Song, my first book, it took me seven years to get to a second full length collection. Sometimes it's a slow walk to evening was a smaller book that kept me afloat while I struggled with My Father's Geography, the second book and my first U of Pittsburgh publication. Timber and Prayer, my second U of Pitt book, was a finalist for the Pulitzer prize. I like U of Pittsburgh Press and am glad to be back with them for this reader. In 2000 I had three books published. It was perhaps a bit of saturation, but they were all important publications. Multitudes went into a second printing. The Ten Lights of God has sold out. Sandy Point is a collector's book, a handmade edition of my work designed for special collections and public and private libraries. It was a banner year for me. You are a practioner of Tai Chi Chuan and involved in the Chinese culture. In 2002, you received a Fulbright to Taiwan and taught at the National Taiwan University. What was this like for you? Did you know the language? How long were you there? Have you ever been censored for what you taught there? The Fulbright experience was amazing. I did not know much Chinese then but have been studying ever since and spent 8 months in Taiwan in 04-05, my sabbatical year, studying Chinese. That first time there as a Fulbrighter was Afaa's Big Adventure, and I made friends I am sure I will have for a long time. There are not many black people there, and although there were awkward moments, Taiwan and China do not have our history of race. It is a different experience. I taught at National Taiwan University, the top university in the area. My students were marvelous. I was not censored. I was teaching the American modernists, Stevens, Bishop, etc. You currently teach at Simmons College and in 2004 chaired the first international conference on Chinese poetry. Is this conference yearly now? You translate Chinese poetry. What are you working on now? Any trips forthcoming to China? When did you first begin to get interested in reading/translating Chinese writing/writers? The next conference will be next year, three years after the first one, so it is not a yearly event. It is such a huge project I have needed this time to assess it and to rest in order to begin to prepare. I ma working on translations of poems by Zang Di, Yu Jian, Wang Xiaoni, and Yi Sha, all Mainland poets. Back in 1984-85 I took the Sunday Chinese lesson in Baltimore's Chinese community. It's the kind of school Chinese communities set up for the kids which also often includes an adult class. That was mostly basic pronunciation. I have been interested in Chinese culture since I saw Bruce Lee play Kato in the Green Hornet back in the late sixties, as were many black kids at that time. But when a white coworker gave me a gift of Gia Gu Feng's translation of the Dao de Jing with photos by Jane English, I went out and bought Alan Watts' book Dao, the Watercourse Way. I know more about Daoism now, which is to say I know nothing. My connection to Chinese culture is one I have developed and maintained along an intuitive pathway. It just feels like what I should be doing. I have had friends who said their lives made sense when they went to Africa. Mine made sense when I went to Taiwan and China. You taught at numerous colleges before teaching at Simmons. What are some of the things you try to teach your students about writing? What do you find most challenging in the classroom? Respect for poetry is a main issue for me in teaching both undergraduates and graduates, but especially undergraduates. At Simmons my students are almost always young women, and they are sometimes surprised by my insistence on establishing a common language about the more technical aspects of the art. I work to create a safe environment but also one that is challenging. In my eighteen years of teaching poetry workshops, I have only a few students who have stayed in the art. Ernie Hilbert is a marvelous poet and editor of Contemporary Poetry Review. Marion Wrenn, another fine poet, is editor of The Painted Bride. They were my students at Rutgers. You are a Cave Canem Elder. Discuss the importance of this for you. I was the first to be named an Elder of Cave Canem, and Elizabeth Alexander and I were the first faculty invited by Toi and Cornelius to teach there at Cave Canem. I have watched the retreat grow and help foster the careers of several young poets. It is amazing. I am very proud. Some of them call me Baba, which means "father," or Mr. Weaver. I guess those translate as elderly. Just joking! Share any secrets you have about balancing your time. I live alone and take naps. Oh, there are many. I have loved so many books and individual poems. Taiji is marvelous, and I like to do it for the sheer joy of it. I enjoy taking walks, photographing my way through a place, eating at fine restaurants. Is this one of those "singles" questions? Very clever. Every Saturday morning, a group of writers get together called Bagel Bards, which is open for anyone to come to. Founded by Doug Holder and Harris Gardner, I find it to be a great time of chatting with other writers. This is how I met you. Talk about coming to Bagel Bards and what it has meant to you. Oh for a semi-reclusive poet like me it is a real joy. I take the bus down the hill or have walked in nice weather. It is a great crowd. Doug and Harris have done a wonderful thing. I love being around other poets and artists. To the public, make a poet friend today. After all our blustering ego, we really are quite nice. Who else would fiddle with words the way we do?